Jeera (also called Cumin Seeds in English and botanically, Cuminum Cyminum) is Indian Spice as well as ayurvedic medicine used for several diseases of the digestive, respiratory, circulatory and reproductive system. It becomes an important part of spices in Indian food because it promotes healthy digestion and prevents many diseases related to digestion and abdominal organs. In ayurvedic medicine, it is used because of its carminative, antispasmodic, digestive stimulant, antacid, astringent, anodyne, diuretic actions. It can help to treat acid peptic disorders, flatulence, abdominal distension, intestinal gas, worm infestation, nausea, vomiting, loss of appetite, irritable bowel syndrome etc. Botanically, Jeera (cumin) is Cuminum Cyminum and a member of Apiaceae family (parsley family). Fruits Fruits contain 2 mericarps and a single seed. Fruits are ovoid achene or lateral fusiform – 4 to 5 mm long. Seeds Seeds are longitudinally ridged, oblong in shape and having yellow-brown color. 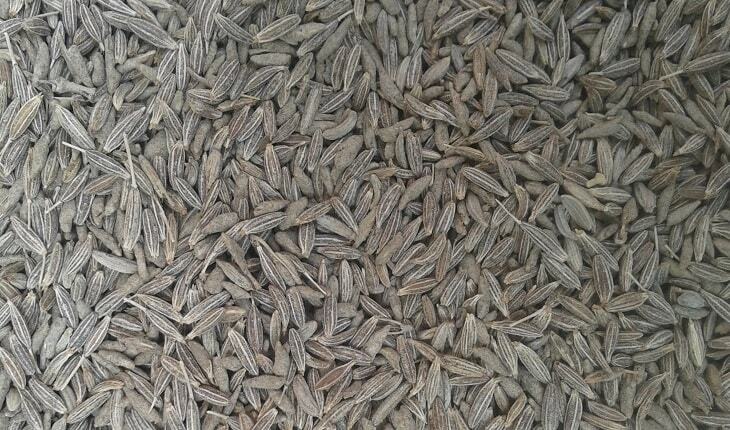 Jeera is a name given to Jeera plant seeds, also called cumin seeds. Jeera or cumin seeds are the main medicinal part of cumin plant. Jeera churna (ground cumin powder) is used in ayurvedic medicine and seeds as a whole can be used in food as condiment. Jeera powder is found in many ayurvedic medicines as an important ingredient. Jeera (cumin) is a good source of iron, manganese, vitamin B1, calcium, magnesium, and phosphorus. Jeera (Cumin) modulates the secretion of acid in the stomach, improves appetite and reduces gas formation. It provides strength to the stomach, intestine and liver, according to Ayurveda. Jeera (Cumin seed) has following healing properties. The medicinal effects of Jeera (cumin seed) appear on three main organs in the body i.e. stomach, intestines, and liver. According to Ayurveda, it provides strength to these organs and reduces chances of infections by fighting off microbes and bacteria. In ancient India, it was included in food and now becomes a part of many recipes as a condiment to prevent water-borne diseases and gas formation in the abdomen. It is a most suitable home remedy for all symptoms occurring due to gas accumulation in the abdomen. Jeera (cumin seed) has appetizer effects, which are due to its action on stomach and liver. In the stomach, it modulates the secretion of gastric acid. It also increases the pancreatic juices from the panaceas. Furthermore, it acts on the liver and increases the bile flow into the intestine. Through all these mechanisms, it improves appetite, increases the digestive powder and enhances the absorption of the food. For the best results, Jeera is used along with Pippali (Long Pepper) powder in following way. The dosage of this Jeera mixture is repeated twice daily and taken with warm water 30 minutes before food. Jeera (cumin seed) is an excellent ayurvedic remedy to improve the desire to eat and loss of taste. According to Ayurveda, it occurs due to AMA (toxins) accumulation in the body and Jeera reduces these toxins and promotes appetite, increases the desire to eat, and improves the taste of mouth. In this condition, alone Jeera can be taken in dosage of 1/2 teaspoon with warm water. If it occurs due to fever or infections and continues even after the treatment, then Jeera churna should be taken with coriander seed powder and Chirayata (Swertia Chirata) powder in following way. In all diseases and symptoms under acid peptic disorders, the following Jeera combination is useful and effective. Jeera (cumin seed) has antiemetic characteristics, so it can help to treat nausea and vomiting. It can be used in following way. Jeera Arq (Cumin distillate): 10 ml twice daily before a meal. It can be used in all cases of nausea and vomiting. Jeera Churna with coriander seed powder if vomitus is sore and acidic in nature. Jeera churna with Trikatu Churna if the patient feels the sweet taste in mouth, excessive salivation, drowsiness, and heaviness. Jeera churna with Sendha Namak if mouth dryness, hoarseness, and vomiting with the loud sound of belching. Roasted Jeera Churna or cumin seed powder along with Ajwain (Carom Seeds), Sendha Namak, Sonth (dried ginger), and Saunf (Fennel seeds) is helpful for diarrhea. This mixture should be taken with water in a dosage of 1 teaspoon twice or thrice daily. Jeera Churna (ground cumin) can also be added in curd (yogurt) to get relief from mild diarrhea. The antiflatulent and carminative properties of Jeera (cumin seeds) help to cure the flatulence, bloating or abdominal distension. It prevents gas formation in the intestines and reduces the AMA (toxins) formation in the alimentary canal. This action also makes it an effective solution for flatulence with the bad or foul smell. In Ayurveda, the Namkeen Jeera and Jeerakadi Churna are used for antiflatulent and carminative benefits. Jeera (cumin) has antispasmodic action and prevents gas accumulation in the intestine. It is effective when abdominal pain occurs mainly due to the accumulation of gas in the abdomen and occurring along with heaviness in the abdomen. The Namkeen Jeera can be used for the same purpose. Constipation or excessive intake of salt, sugar and green pepper can cause itching and make the skin dry. This type of itching becomes worse at night. In such case, a half teaspoon of Jeera Churna (cumin powder) should be taken with water thrice daily. Massage should be done with pure mustard oil processed with Neem Leaves or Nalpamaradi Thailam (Oil). In Indian tradition, Jeera along with Ajwain (carom seeds) and jaggery (Gur) is given to women after delivery to restore the health and treat the postpartum debility. Pancha Jeeraka Gudam prepared from Jeera is advised by ayurvedic doctors for the treatment of weakness, debility or fatigue. Jeera (cumin seed) powder is effective to reduce the burning sensation and headache that occurs in acute arsenic poisoning. Jeera Churna and Kala Jeera (Caraway/Carum Carvi) can be taken with jaggery (Gur) for 2 to 3 weeks in chronic low-grade fever accompanies with fatigue and malaise. This mixture reduces fever, fatigue, malaise and weakness. Jeera along with Dhania (Coriander), black salt (Kala Namak) and ginger helps to reduce the excessive thirst. After delivery, many women are worried about low breastmilk supply. Jeera (cumin seeds) has galactagogue action, which promotes the production of milk. It also improves the quality of the milk, which makes the milk easily digestible for the baby and improves the digestive health of the baby. According to Ayurveda, DOOSHITA STANYA can result in many diseases in the baby basically digestive problems. Jeera detoxifies the milk and enhances its taste and improves the milk quality. Jeera or Cumin Seeds in natural form and ground cumin (Jeera Churna or Cumin Seed powder) are considerably safe in food as well as in medicinal amounts discussed above. Jeera (Cumin) is well tolerated and there are no side effects reported with the use of cumin seeds. We are making old method jeera water for drinking. I want to know is daily jeera water good for drinking. How will make good jeer water for everyday use?